A four block-tall Platform Block from New Super Mario Bros. Expands into a series of blocks when hit. Platform Blocks, also known as face blocks are objects that first appear in New Super Mario Bros. Each time Mario hits the block, another block pops out of the previous one. 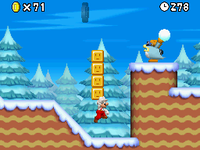 By hitting it multiple times, Mario can use the series of blocks to reach higher platforms. However, if Mario takes too long, the blocks will collapse back to normal. Mario hitting a Platform Block in New Super Mario Bros. Platform Blocks are introduced in New Super Mario Bros., starting out as a single block with a face on it. Up to four blocks can be stacked, and they can also be used to enter horizontal pipes or block enemy attacks. After a while, they will revert back into a single block. The blocks return in Super Mario 3D Land, where the main block is an ! Block. It can conjure more or less than four blocks. The blocks do not always go straight up, they go in some paths as well. The face blocks even have the same design, and the ! Block is sometimes the size of regular blocks or sometimes bigger. There are certain ? Blocks in Super Mario 3D World that act as Platform Blocks, which produce Empty Blocks. In Bowser's Bob-omb Brigade and Super Block Land, there are larger versions of them. They can also be activated by tapping on the Wii U GamePad. In Super Mario Maker 2, giant, yellow ! Blocks that act as Platform Blocks appear as course elements. When hit multiple times, they produce giant Empty Blocks. This page was last edited on April 19, 2019, at 10:54.